Every now and then, a new artist sneaks onto the children’s literary stage and dazzles us with such unbridled talent, that we’re left standing on our tippy-toes begging for an encore. Last year, one of those artists was London Ladd. 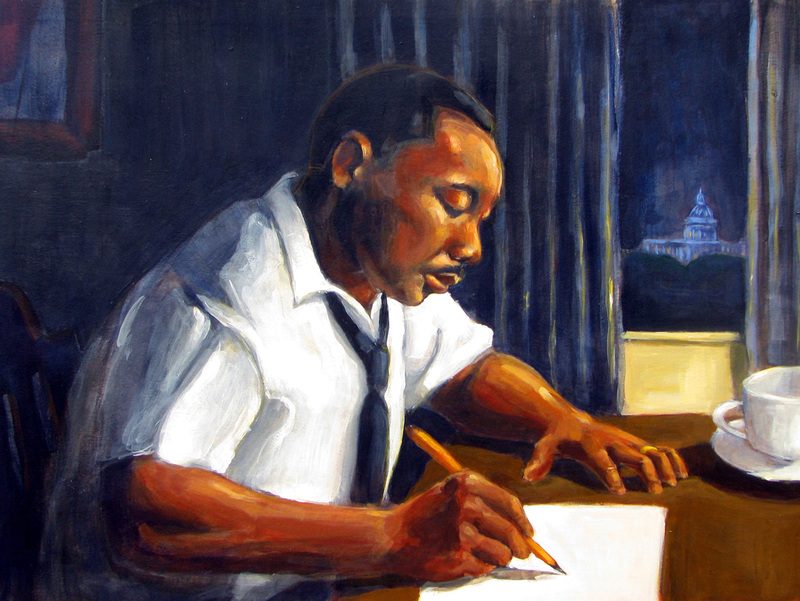 Ladd made his debut illustrating the book March On!, written by the sister of Dr. Martin Luther King Jr., Christine King Farris. With this book, Farris offered her account of the day Dr. King delivered his historic I Have a Dream speech. The book published last month, on the 45th anniversary of King’s march on Washington. 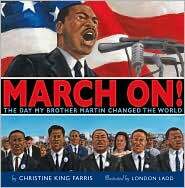 In a video, Ladd talked about living his dream illustrating children’s books, and about the day when March On! published. The excitement in his eyes sparkled as he recalled the day he gathered up his family and headed for the book store to take pictures. 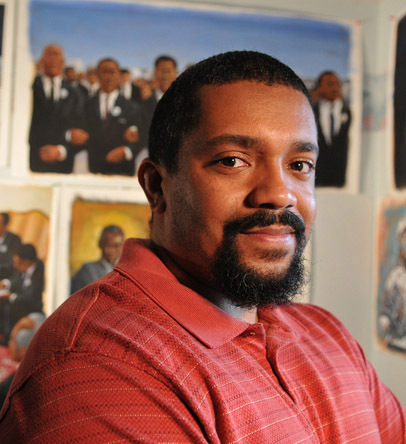 When he’s not illustrating, you’ll find him teaching art at the Kuumba Project, an after school program that introduces visual and performing arts to inner city kids. Don: How did you become involved in the March On! project? London: Andrea Davis Pinkney hired me after a mutual acquaintance of ours referred her to my website. She liked my work and thought it would be perfect for this project. How did you become interested in illustrating for children? London: I wanted to bring words to life for children with my artwork. My first love was comic books, especially graphic novels. I loved the imagery and storytelling that came across in these books. What kind of training have you received to prepare for your career as an artist? London: I graduated at Syracuse University where I received my degree in illustration. 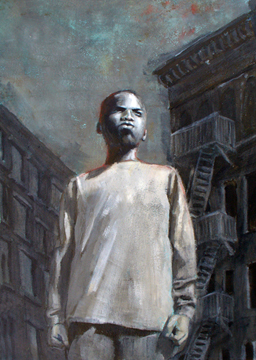 I was lucky enough to study with great illustrators like James Ransome, Bob Dacey, Yvonne Buchanan, John Thompson and Roger DeMuth who taught various aspects of not only illustration but design and painting. What is your mission as an artist? London: That’s a great question, I think my mission is to tell a story with beautiful vivid illustrations that children will enjoy. London: Acrylic paint on Bristol board because it doesn’t rip, buckle or bend, when I’m painting on it. I also love painting in my sketchbook. The Earthbound recycled paper is the best at handling thin washes and/or heavy opaque layers. Tell us about your process of illustrating a children’s book. London: After I except the project I read the manuscript over and over so I can understand what’s being said by the author. I really try to find myself in the story because then it becomes more personal to me, like a form of “method illustrating.” This gives me a better understanding of the projects composition, design and color choices. I quickly sketch down ideas and keep sketching then I put the drawings away for a few days and do some research. When I return I combine my research and refined sketches to compose the dummy book. I send the dummy book to the publisher and after they review and make suggestions I begin the paintings for the final art work. When art work is completed I package it and send to the publisher. What inspires you as an illustrator? Are there certain topics/stories you enjoy more than others? London: I love history so anything historical fascinates me because it allows me to learn while working. African American history especially interests me because there are so many untold stories. What were the biggest challenges in illustrating March On! London: I wanted to create an MLK that conveys an intimate feeling, a behind the scenes perspective without making him too iconic. Christine’s story is a personal first hand account so I wanted to show him as an ordinary man who happened to do something extraordinary. There are so many books, magazine articles, photos, documentaries, etc, about Martin Luther King Jr., I wanted my vision to be unique. How long does it typically take you to illustrate a children’s book, and how do you balance work, family, and other? London: The entire process from first call to handing in finished work takes 7-9 months depending on the subject matter. Sometimes it’s difficult to juggle everything with my families various schedules. But we make an effort to really spend quality time together. Do you visit schools, and can you speak a bit about your program? London: Yes, I started visiting schools recently. During these visits I talk about my personal journey from student to illustrator. I explain the career of an illustrator and I try to inspire the kids to persistently reach for their dreams no matter their circumstance. I share with them the struggles that I experienced and how it built my character. I want kids to know that they can achieve any level of success if they put their mind and heart to it. What are your interest/hobbies beyond art? London: I love to travel and enjoy being around my extended family. In the summers I like visiting state parks around the State of New York. London: I don’t remember any children’s books as a child only comic books but I know the first children’s book I gave to my daughter, Goodnight Moon. I love that book, not just because of the sentimental value but also the simplicity of everything about it, from the words to the illustrations. Who are some of your favorite children’s book authors and illustrators today? And why. London: There are so many illustrators whom I admire because they blazed the path and are successful and so amazingly talented. Jerry Pinkney, Ashley Brian, Floyd Copper, Leo and Diane Dillon, James Ransome, Brian Collier, Kadir Nelson, Shane Evans, Ezra Jack Keats, E. B. Lewis, Greg Manchess, John Thompson, Bob Dacey, Yvonne Buchanan, James Garney, N.C. Wyeth. As an illustrator who is African American, do you ever feel the pressured to illustrate certain types of manuscripts? London: To be honest with you as an artist just entering the field I am grateful to illustrate books regardless of the subject. As long as they are good quality projects that are interesting and challenging I am open to them. If these projects happen to be African-American themed I’m fine with it. Maybe after a few years I’ll feel differently and want to do other types of projects. Who are your cheerleaders, those who cheer loudest for you along the way? London: My wife, daughter and mother, they’ve been there with me from the beginning through the good and the bad that’s why I dedicated the book to them. What advice can you offer to aspiring illustrators of children’s books. London: Passion, Perseverance and Patience. Passion in what you do, perseverance to fight through tough times and patience in knowing that you will reach your goal. What can your fans look forward to in the future? 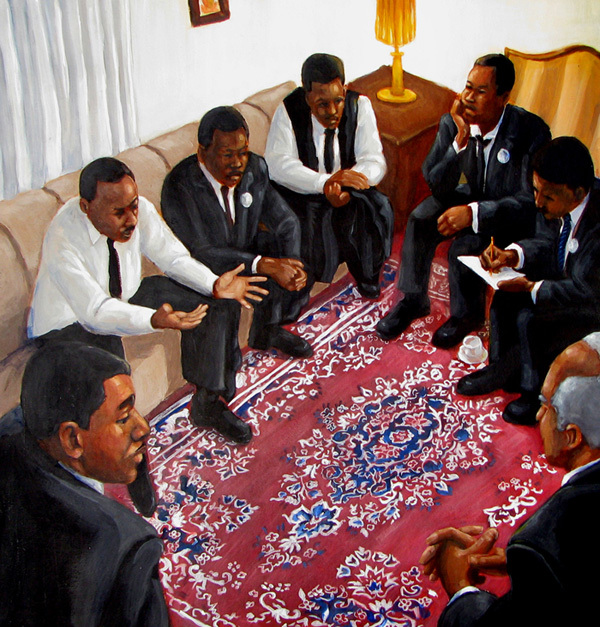 London: I’m currently working on my second children’s book which is about a well-known African American. I’m excited and blessed to have an opportunity to do what I love. Ladd, in his first picture book, demonstrates a rare talent for portraiture-even the faces in his crowd scenes are individuated. Like Farris, he resists the temptation to lionize his subject: instead of looking iconic, his King looks human-in other words, capable of inspiring the reader. Ladd’s acrylic paintings are an excellent accompaniment to the text. His use of color and varying perspectives creates a great deal of visual energy, extending the excitement of the event. Ladd, a talented figure painter and first-time picture-book illustrator, offers his own fresh and affecting take on these now familiar events; his images expand and enliven the well-known facts and ably expand on Farris’s powerful family story. Great interview! Wishing you continued success, London. Go SU :). Impressive debut! I appreciate the simplicity of his mission, and feel sure there will be good things to come from this talented illustrator. i am sijo john children book illustrator from india. Very nice , thanks a sharing..